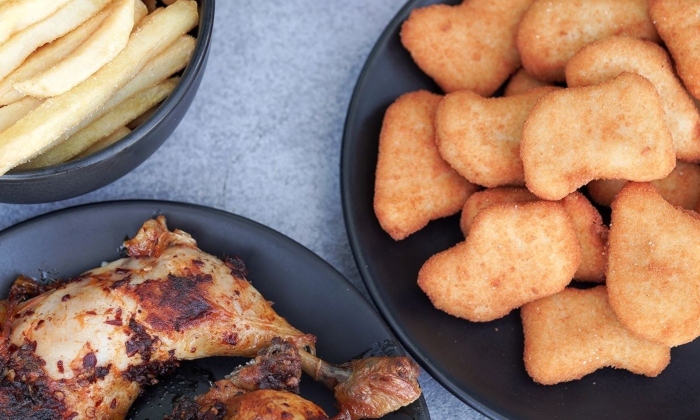 In the mood for chicken and chips? Order mouthwatering chicken and chips, burgers, and wraps from an Ogalo restaurant near you. From $5 Delivery. No Minimum Spend. Get Ogalo delivered to your door! Portuguese-style Australian restaurant chain, Ogalo, is beloved by Aussies for its special recipe and unique basting sauce, featuring fresh chilli, garden herbs and exotic spices that literally draw out the natural goodness of their meat. They're so dedicated to their chicken, they even cut each one by hand! Their fresh ingredients and wallet-friendly prices have seen Ogalo -- which started as a family-run restaurant -- develop into a franchise business with locations throughout Australia. With burgers, wraps, chicken packs and a separate kids menu, you're pretty much guaranteed to find something for every taste preference at Ogalo. Down for some spice in your life? Or maybe you're partial to a mild meal? Either way, Menulog and the guys at Ogalo have you covered. How about a Chicken Prego Burger with grilled onion, melted cheese, freshly cut lettuce, tomato and special Ogalo Prego sauce on a toasted sesame seed bun? Or, how about the Hot Ogalo Wrap? Only for the brave, this one has more than a kick, courtesy of the hot and spicy Ogalo piri piri sauce. For the herbivores among us, the Ovegie Wrap never disappoints. Or, a whole, half, or quarter chicken marinated in Ogalo's secret herbs and spices recipe? After tasting one of those bad boys, you'll never look at another chicken shop again....Log onto the Menulog app or website and within a few taps your Ogalo order could be delivered right to your doorstep!